Home / Opinion / Social Media / Netizen appeals to Senator Bam Aquino: "Ikaw ay co-author lang, hindi sponsor." Netizen appeals to Senator Bam Aquino: "Ikaw ay co-author lang, hindi sponsor." Joval Chavez Kisinamal wrote on Facebook to Senator Bam Aquino in reply to the video of Vincent Penaflor being thankful to during a protest on free tuition fee on college. Kisinamal said, Aquino should have included his fellow Senators namely former Senator Bongbong Marcos, Senator Angara, Senator Recto, Senator JV Ejercito, et'al as co-authors since a law in the Philippines have to go through the Senate and Congress before approval. In a Vera Files articles posted April 12, 2018 wrote that according to the office of Aquino the Senator didn't claim to be the principal author of the free tuition fee law. Aquino filed Senate Bill 177 on June 30, 2016. This was submitted right after Sen. Ralph Recto filed a similar measure, which makes him the principal author. As chair of the Committee on Education, Culture and Arts, Aquino led the passage of the bill in the Senate -- making him a "principal sponsor and co-author." Duterte signed the bill into law in August 2017. 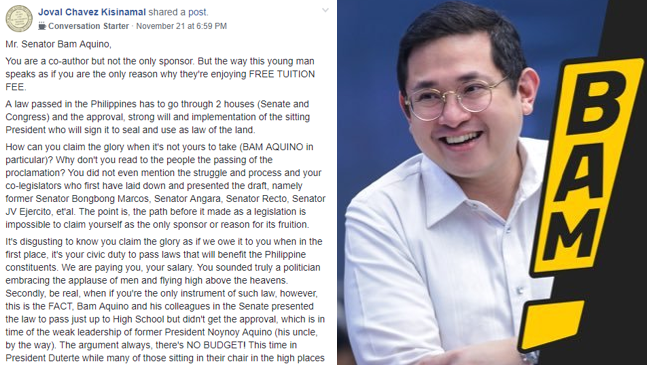 In the video uploaded by Senator Bam Aquino supported by the post of Kisinamal, Aquino thank Vincent, the student speaking in front of students in a protest after saying that he can study in College because of Senator Bam Aquino. 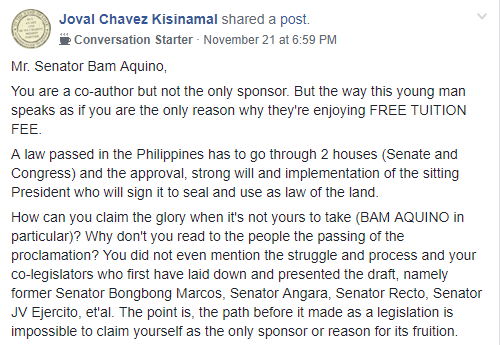 Kisinamal on his post in Facebook corrected that it was not only Senator Bam Aquino should be the one to be thankful for but also other co-authors as well. The netizen cannot express his anguish against Aquino most especially the Senator is connected to the opposition Liberal party that includes former President Noynoy Aquino that happened to be his uncle. You are a co-author but not the only sponsor. But the way this young man speaks as if you are the only reason why they're enjoying FREE TUITION FEE. A law passed in the Philippines has to go through 2 houses (Senate and Congress) and the approval, strong will and implementation of the sitting President who will sign it to seal and use as law of the land. 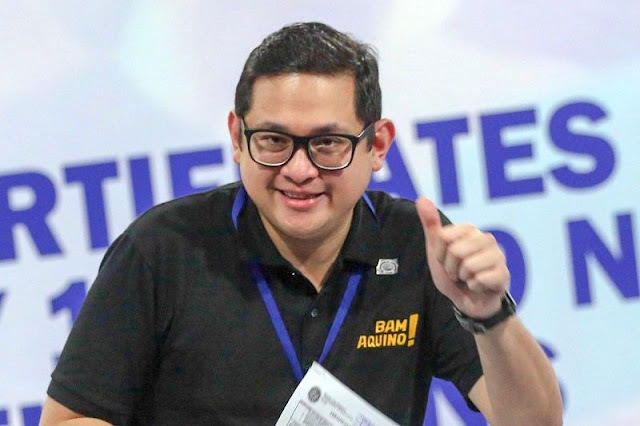 How can you claim the glory when it's not yours to take (BAM AQUINO in particular)? Why don't you read to the people the passing of the proclamation? You did not even mention the struggle and process and your co-legislators who first have laid down and presented the draft, namely former Senator Bongbong Marcos, Senator Angara, Senator Recto, Senator JV Ejercito, et'al. The point is, the path before it made as a legislation is impossible to claim yourself as the only sponsor or reason for its fruition. It's disgusting to know you claim the glory as if we owe it to you when in the first place, it's your civic duty to pass laws that will benefit the Philippine constituents. We are paying you, your salary. You sounded truly a politician embracing the applause of men and flying high above the heavens. Secondly, be real, when if you're the only instrument of such law, however, this is the FACT, Bam Aquino and his colleagues in the Senate presented the law to pass just up to High School but didn't get the approval, which is in time of the weak leadership of former President Noynoy Aquino (his uncle, by the way). The argument always, there's NO BUDGET! This time in President Duterte while many of those sitting in their chair in the high places (ELITES and POWERFUL) hated the leadership of this government and making PRRD as if the villain of the Filipinos (because they're not the priority of President Duterte) approved the FREE EDUCATION even up to tertiary, though the law passed only up to HS in its original draft. Blabbers who don't do their homework is such a blind follower and they've been like a person following their abductors blindly and foolishly. What a shame. Tama nga LP forever (Laging Passive) ang PEG. Kaya ikaw Totoy Vincent Penaflor and to all youngsters, mag-isip at mag-aral ng mabuti. 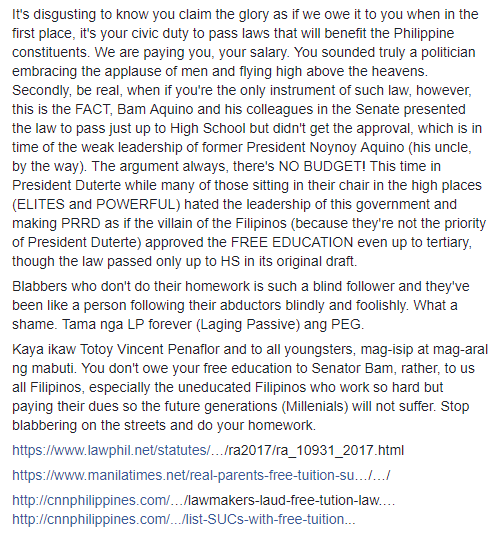 You don't owe your free education to Senator Bam, rather, to us all Filipinos, especially the uneducated Filipinos who work so hard but paying their dues so the future generations (Millenials) will not suffer. Stop blabbering on the streets and do your homework."